We all get the urge to snooze sometimes. It’s been a big feature for Inbox for Gmail – offering the ability to push emails away until you’re ready to tackle them. Detailed in a blog post today, the Snooze feature will be getting a new look and new features over the next week. The big change for Snooze is the addition of two new options: ‘Later this week’ and ‘This weekend.’ Both of those commands hold emails aside until – you guessed it – later that week or on the weekend. 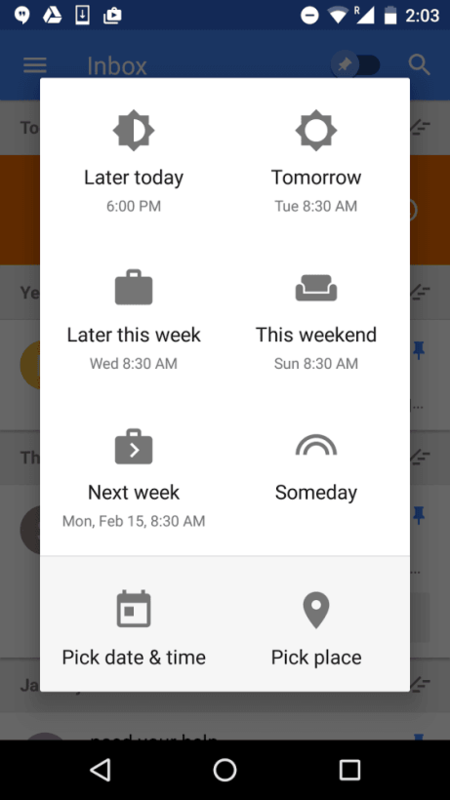 But for those who might have non-traditional weekends – say, days off on a Tuesday and Wednesday – Inbox now lets you customize when your weekend actually is, the same way you can set your preferred morning time. Google says these improvements to snooze were made a result of consumer feedback, so if you’re an Inbox for Gmail power user, you’ll likely be able to pare down some of your custom snooze options with these new features.